The founder of earth day was Gaylord Nelson. His holiday has flowered into this amazing commemoration — some have called it the largest secular holiday in the world. Last year, as the forces of anti-environmentalism were gaining increased momentum, kids mobilized and celebrated the March for Science — elsewhere, people protested against climate change. But let’s not forget another of Gaylord Nelson’s less successful initiatives — in 1970 he proposed a national environmental amendment to the constitution. It ultimately failed — perhaps the world wasn’t ready. But now, despite all the great mobilization around earth day, our environment suffers, and the world teeters on the brink of climate catastrophe. If we want to turn around this sad state of affairs, and heal our world, we need to honor both dimensions of Nelson’s legacy — celebrating earth day, and revisiting a call for constitutional amendments that honor and protect our RIGHT to a healthy environment. We need constitutional amendments in both our state and federal constitutions. Is the world finally ready to realize the vision and power of constitutional protection for our environmental rights? Learn the power of Green Amendments and how we can reclaim this legacy in The Green Amendment, Securing Our Right to a Healthy Environment. In honor of Earth Day and the goal of advancing a nationwide Green Amendment movement, we will be giving away free eBook copies of the Green Amendment all weekend. Looking for a paperback copy? 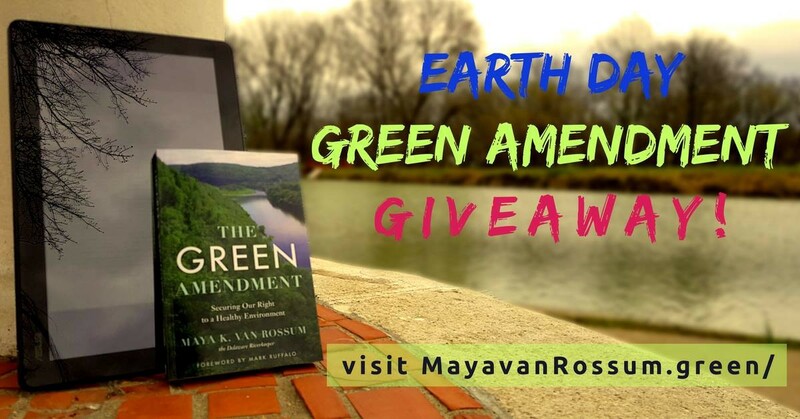 For an entire week, starting April 21st through to April 28th, you can also win a free paperback copy of The Green Amendment, personally signed by the author when you register on Goodreads​! Check back at www.MayavanRossum.green on those dates when the registration link goes live!